As we wrapped up the year in December, AIP Foundation celebrated a major milestone for road safety. On December 5, 2014, the Cambodian National Assembly approved the new Road Traffic Law, in which motorcycle passengers—including children—are required to wear helmets. This is a significant achievement after years of collective efforts by many organizations. We look forward to the law being implemented later this year and hope to see higher helmet-wearing rates among passengers on motorcycles. Please see below to read more on AIP Foundation’s activities and achievements throughout December. In December, Mr. Greig Craft and Ms. Na Huong Hoang, President and Deputy CEO of AIP Foundation, attended and presented at the Safe Roads | Safe Kids Global Road Safety Summit. The summit is designed to build a movement of stakeholders and raise the issue of global road safety on the international agenda. At the summit, AIP Foundation was featured in a FIA Foundation video presented by Dan Stoner, Associate Vice President for Education, Save the Children US. The video, a call to action, discusses interventions to protect children on the roads and encourages viewers to invest in road safety to save lives. The video features AIP Foundation among other senior road safety stakeholders, including UNICEF, WHO, Save the Children, the Zenani Mandela campaign, and road safety ambassador Michelle Yeoh. The IRF World Road Statistics (WRS) 2014 (data 2007-2012) is now available and features more than 200 countries with data on over 45 key road-related topics. The IRF WRS is a comprehensive, universal source of statistical data on road networks, traffic, and inland transport, providing information in traffic volumes and vehicle usage, road expenditure, road safety, energy consumption and emissions, and more. For more information on IRF World Road Statistics 2014, please click here. Early December, AIP Foundation organized a capacity training workshop for policymakers and journalists from three southern provinces in Vietnam, supported by the Global Road Safety Partnership (GRSP). The capacity trainings provide attendees necessary skills and knowledge around child helmet legislation and implementation in Vietnam. This is also an opportunity for both AIP Foundation and provincial stakeholders to build a community of road safety partners. 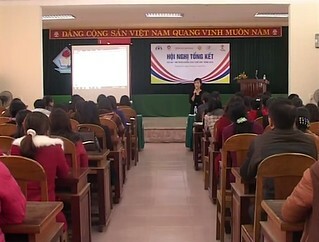 Participants in the trainings included members of the provincial Traffic Safety Committee, Traffic Police, Youth Union, the Vietnamese Fatherland Front, and Vietnamese Women's Association along with journalists. Participants shared lessons learned and experiences on child helmet implementation and visited a primary school to experience the local traffic environment, observe the helmet wearing rates, and watch how the traffic police communicate child helmet use with parents. After the training, the participants committed to follow-up by developing their local action plans supporting the National Traffic Safety Committee's (NTSC) National Child Helmet Action Plan. Under the Nghi Son Refinery & Petrochemical, LLC (NSRP) Traffic Safety Project, three driver safety training courses were organized for community members in the three target communes of Hai Thuong, Tan Truong, and Mai Lam from December 7-21, 2014. The trainings reached approximately 360 motorcycle drivers in the communities and included both classroom-based and hands-on training. Trainees were informed of traffic laws, how to travel on the motorbike safely in industrial zones, and were also provided with the opportunity to practice driving skills. After successfully completing the course, participants receive a certificate of completion and a free helmet. Representatives from Abbott Laboratories, the Hoan Kiem Bureau of Education and Training, and Hoan Kiem Youth Union with AIP Foundation at Traffic Safety Day held at Chuong Duong Primary School. Mid-December, AIP Foundation organized a Traffic Safety Day with Abbott APAC representatives at Chuong Duong Primary School in Hanoi, where 280 helmets were provided to low-income students. More than 380 participants, including 60 Abbott APAC volunteers, representatives from the Hoan Kiem Bureau of Education and Training and Hoan Kiem Youth Union, and students and teachers of Chuong Duong Primary School, attended the event. 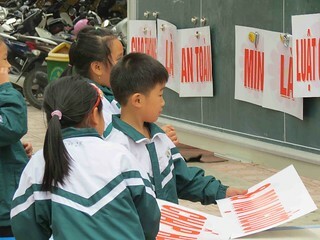 Students engaged in traffic safety games and were instructed on proper helmet use by Abbott APAC. 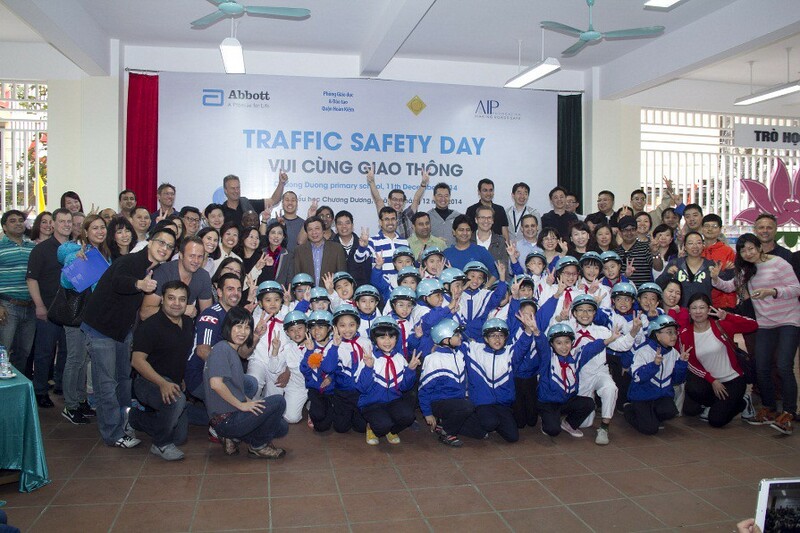 In addition to the Traffic Safety Day initiative, Abbott also supports Helmets for Families programs in Ho Chi Minh City and Tra Vinh. In order to reinforce key road safety messages to students, in December AIP Foundation, with support from ARRB Group organized extracurricular activities for schoolchildren at Ai Quoc Primary School under Helmets for Kids. Over 850 participants were present, including students, teachers, parents, and representatives of the Ai Quoc Bureau of Education and Training, Ai Quoc People’s Committee, and Youth Union. Parents and teachers also participated to learn about road safety with students. 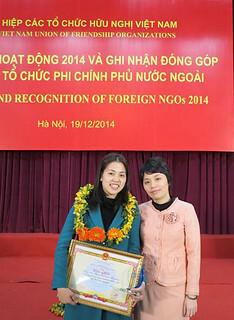 On December 19th, the Vietnam Union of Friendship Organizations (VUFO) awarded the Certificate of its President to AIP Foundation for its outstanding contributions to the socioeconomic development of Vietnam in 2014. The award was conferred at an information-sharing meeting, attended by VUFO awardees. Out of more than 500 non-governmental organizations (NGOs) in Vietnam, AIP Foundation is among 32 who received the award in 2014. In cooperation with Ho Chi Minh City’s District 9 People’s Committee, nearly 70 stakeholders, including district government officials, community leaders, and school administrators, attended the Walk This Way district-level stakeholder planning meeting on December 23. AIP Foundation provided stakeholders an overview of the pedestrian safety program, which aims to increase awareness about pedestrian welfare to create safer walking environments, and enlisted their commitment to it. The Vice Chairman of the District People’s Committee directed the program implementation planning and established the program working committee to strengthen local commitment to, understanding of, and ownership over the project. 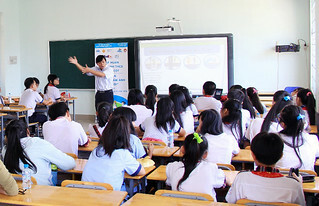 Approximately 48 students from 12 secondary schools in District 9 of Ho Chi Minh City attended a two-day training session on pedestrian safety, photography, and presentation skills, as part of the first phase of the ‘PHOTOVOICE’ project. Sponsored by FedEx Express and implemented by AIP Foundation (a.k.a. Safe Kids Vietnam), ‘PHOTOVOICE’ utilizes photos and reflections from students as a way to educate them on pedestrian safety and advocate for better walking environments. This photojournalism project, part of the long-term Safe Kids Walk This Way program, expects to reach 11,893 students at the 12 schools. Following the training, students will be tasked to capture images of the walking environment around their schools and communities. Later on, they will discuss their observations in classroom sessions with their peers and teachers. The project will culminate with a photography exhibition where student representatives from each school will present photos and ideas for solutions to a panel of key stakeholders in March 2015. The stakeholders will hear students advocate for the improvement of road conditions, who hope to deepen their commitment to improving pedestrian environments. At the exhibition, the best photo will be selected by the panel and the winning student will receive a prize. 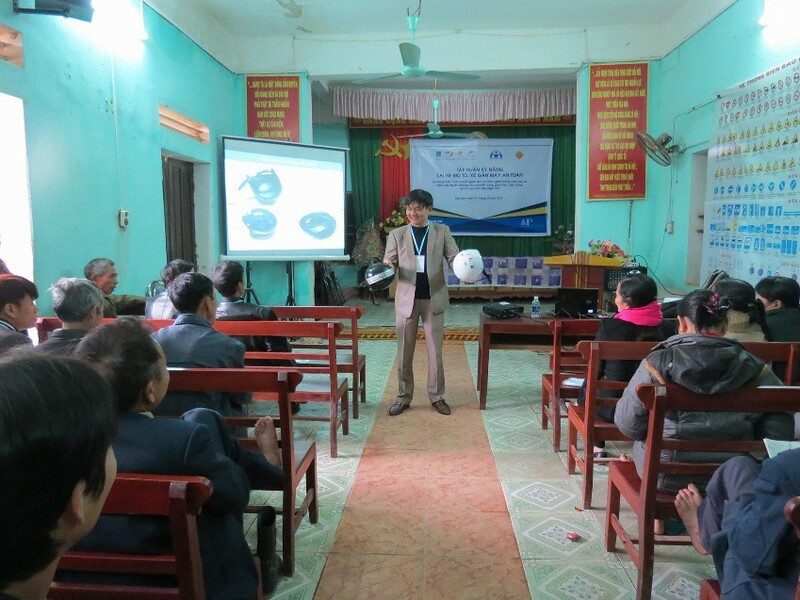 Before the start of the New Year, AIP Foundation’s Tran Thi Nhai leads a discussion with Helmets for Kids project schools from Quang Binh province on lessons learned during 2014. More than 120 people attended a year-end review workshop for the 2014 Helmets for Kids program in Quang Binh Province sponsored by Johnson & Johnson. The workshop aimed to engage attendees in providing feedback to further improve the program in 2015. 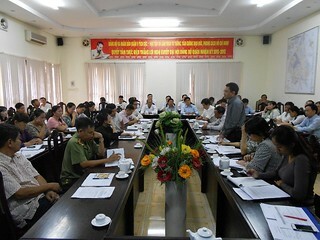 Attendees from all 16 project schools in Quang Binh Province, parent representatives, and high-level local partners including the new Chief Secretariat of Traffic Safety Committee, Deputy Director of Department of Education and Training, and Deputy Director of C67 Police, actively participated. At the workshop, the five schools with the highest helmet wearing rates received certificates of appreciation and schools with the lowest helmet wearing rates presented plans to strengthen their commitment to the project and raise the student helmet wearing rates in 2015. Project schools re-emphasized their support for the Helmets for Kids program and demonstrated a strong interest in seeing its continuation. The Cambodian National Assembly has approved the new Road Traffic Law, in which motorcycle passengers—including children—are required to wear helmets. “When the draft law was about to ‘leave our children behind’ in 2011, AIP Foundation led an initiative that resulted in the inclusion of children in the draft passenger helmet mandate,” explained Mr. Greig Craft, President of AIP Foundation. In response to research findings that 98% of the public was in support of a passenger helmet law, a group of stakeholders including AIP Foundation then submitted a Joint Statement to the Minister of Transport in 2013 appealing for the law to be passed. This statement was mentioned in the UN Secretary-General’s report, Improving Global Road Safety, and has gained support from individuals, the private sector, and civil society. In May 2014, AIP Foundation presented a study to the Government demonstrating that 561 lives could be saved, 10,572 head injuries prevented, and US $98,618,422 could be saved by 2020, if the law was passed in 2014. AIP Foundation commends the National Assembly for their leadership to pass this historic law. This month, celebrity road safety ambassador Michelle Yeoh, His Excellency Deputy Prime Minister Sar Kheng, and special guests came together to support the donation of 6,652 helmets to students and teachers of six schools in Phnom Penh. 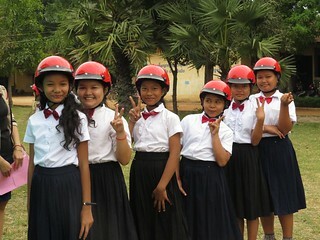 The helmet donation held at Toul Svay Prey Primary School was organized by AIP Foundation with the support of USAID’s Development Innovation Ventures (USAID-DIV) and cost-share partners The UPS Foundation, FIA Foundation/Road Safety Fund, and US CDC as part of the “Head Safe. Helmet On.” project. Among the 3,000 attendees were Director General Mr. Saul Billingsley of FIA Foundation; Ms. Michelle Yeoh, Actress and Global Road Safety Ambassador; Dr. David Sleet, Associate Director for Science of CDC; Mr. Jeff McLean, General Manager of UPS Vietnam; Mr. Sean Callahan, USAID Cambodia Deputy Mission Director; and Mr. Greig Craft, President of AIP Foundation. His Excellency Deputy Prime Minister Sar Kheng presented Cambodian Government Medals and awards to supporters in testimony of the Government’s gratitude for their collaboration and contribution to road safety efforts in Cambodia. Watch footage from the event here. Read more here. 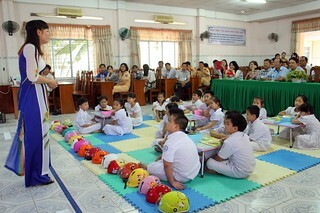 Mid-month, parents of primary school students took part in a training course focusing on road safety, the importance of wearing helmets properly, and the role parents play in ensuring children wear helmets on motorcycles. 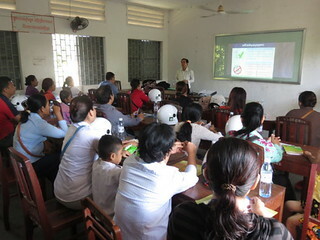 Supported by Manulife Cambodia, at the training parents made commitments to always place a helmet on their children each time they travel by motorcycle, regardless of distance or time. The training also informed parents on the status of the new traffic law mandating all motorcycle passengers to wear helmets. In December, Cambodian government officials visited Vietnam and Singapore to discuss best practices in road safety. Coordinated by AIP Foundation, the enforcement tour was part of the USAID-Development Innovation Ventures-funded “Head Safe. Helmet On.” project in Cambodia. Cambodian officials on the study tour consisted of delegates from Cambodia’s General Commissariat of National Police and the General Secretariat of the National Road Safety Committee (NRSC). 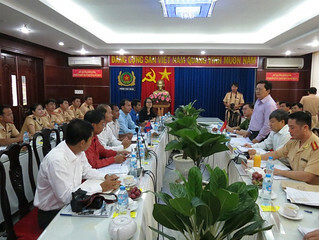 Delegates met with Ho Chi Minh City’s Traffic Safety Committee, Department of Education and Training, and Faculty of Traffic Police, as well as the Singapore Road Safety Council and Singapore Traffic Police. Delegates discussed and shared experiences on helmet legislation, successes, challenges, and lessons learned in relation to traffic law enforcement and education in order to more effectively enforce the Cambodian Road Traffic Law, recently approved by the National Assembly on December 5, 2014. Students prepare for their performance to raise awareness about helmet safety among their peers during the USAID HSHO Helmet Handover Ceremony on December 20, 2014. At the end of December, teachers and students from primary schools in Kampong Speu and Kandal Provinces received 9,754 high-quality helmets at helmet handover events. The occasions engaged community members and schools together in order to further develop local support for child helmet use. The helmet donations were organized by AIP Foundation as part of the “Head Safe. Helmet On.” project with the support of USAID-Development Innovation Ventures and others. 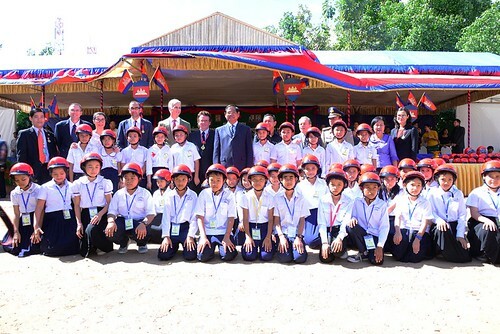 At Chambak Primary School in Kampong Speu Province, the helmet donation ceremony was presided by His Excellency Hun Many, President of Union of Youth Federations of Cambodia, along with Secretary General of the National Road Safety Committee (NRSC) and the Deputy Governor of Kampong Speu Province. Attending the ceremony in Kandal was His Excellency General Yun Chhunny, Deputy Commissioner General of National Police, Secretary General of the NRSC, and the Deputy Governor of Kandal Province. “We are dedicated to making sure children are informed of the importance of wearing a helmet while on the road and will continue to take actions addressing this important public health issue,” said Mr. Kim Pagna, Country Director of AIP Foundation Cambodia. Read more about the ceremony in Kampong Speu Province here. Read more about the ceremony in Kandal Province here.